"The W.A. de Vigier Foundation has been supporting young Swiss entrepreneurs for 30 years with funding, know-how and a high-class network. 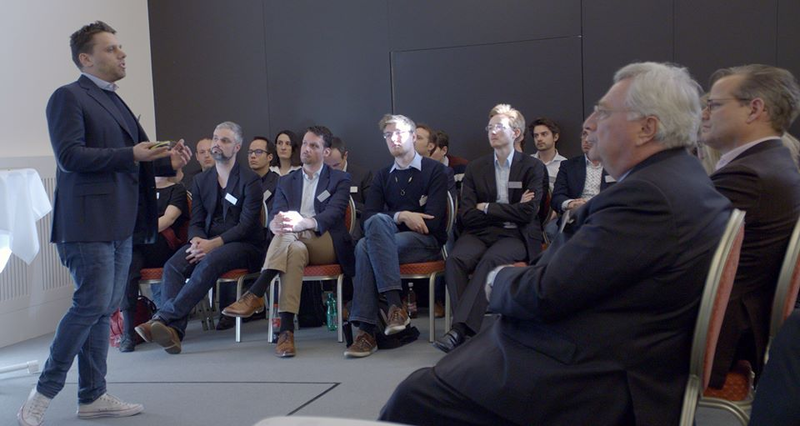 To celebrate our anniversary, we organised our first 'Selection Day', on which 60 startups pitched their ideas to the Foundation Board, selected guests and investors. There were so many innovative projects that we accepted 17 instead of 16 startups to go forward in the competition," says Regula Buob, Managing Director of the W.A. de Vigier Foundation. "Our guests saw with their own eyes just how difficult it is to make a selection. We could easily add twice as many startups to our shortlist. This shows that there is a clear need for startup funding, that there is a demand for it," continues Buob. The loss of cognitive performance and of executive functions are important risk factors that have been largely ignored in fall prevention. The Dividat Senso takes these factors into account by linking scenarios of steps and weight shifts to a cognitive challenge through adaptive exergames. The training with Dividat Senso has shown to significantly reduce the risk of falling in seniors. The fluctuating nature of renewable energy poses a major challenge in terms of storage. Batteries are useful but come with limitations. This startup developed a hydrogen-based energy storage solution that is safe, compact, efficient and affordable. A pilot plant is currently operational and the company is entering the commercialization phase. The possibility to solidify materials utilizing light revolutionized the dental industry in the 70s. Lumendo’s medical fillers solidify upon pressing a button and work not only for teeth, but for all hard and soft tissues, which need to be replaced in the body. The innovative fillers enable surgeons and dentists to perform novel procedures, increase treatment efficacy and drastically reduce treatment time. Mirrakoi makes high-end 3D design for industrial and product modeling accessible to everyone. XirusCAD, the brand-new 3D digital modeling technology developed by Mirrakoi enables designers as well as architects and engineers to create complex surfaces much faster and more intuitively than with currently available technology. The technology’s backbone is a fundamentally new approach to the mathematical description of 3D objects. Construction companies can cut their fabrication and installation costs by 40 to 80 percent, thanks to Mobbot’s unique 3D concrete printing technology and its fully digitalized process. The production of expensive casting molds is completely eliminated, the custom-made elements are delivered in no time. Currently the startup focuses on underground concrete elements for electrical applications. The 10 trillion USD construction industry contributes up to 10 percent of man-made carbon emissions and building operations consume 40 percent of the entire world energy. Nanogence develops eco-friendly additives and technologies for the construction sector to reduce cost and energy, optimize performance, improve durability and reduce the carbon footprint for sustainable construction. Soneva is a drawer for keeping uncooled foods fresh. It can be built in to a regular kitchen drawer. The container creates a vacuum, thereby reducing the growth of bacteria by lowering the oxygen level and protecting the food from moisture, light and insects. Generating and maintaining the vacuum uses much less energy than a refrigerator. The microbiome is involved in a majority of chronic diseases related to metabolism and the immune system. PharmaBiome established a proprietary technology to isolate, culture and characterize gut microbes. Based on their functional interaction, the startup formulates them into pharmaceutical grade mixed cultures to sustainably modulate the gut’s microbiome and thereby treat microbiome-linked diseases. Piomic develops a wearable medical device for the treatment of hard-to-heal wounds. Acceleration of wound healing processes reduces pain, the risk of wound infections and increases the quality of life in patients suffering from chronic wounds. The unique energy-based technology is portable, easy-to-use and fits seamlessly into the workflow of healthcare professionals. Identity fraud and the protection of personal data are huge challenges. PXL develops state-of-the-art computer vision and machine learning technologies for fully automated customer onboarding and identity verification using camera-based devices. PXL enables the creation of trusted digital identities which can be used to share personal data and interact in the digital space safely across industries. Scewo develops a wheelchair that allows the user to climb stairs and move more freely. Upon approaching steps, two rubber tracks under the wheelchair are extended. The chair’s seat is kept level at all time. The transitions on and off the stairs are automated. The software developers strive to increase the level of automatization, to help detect critical situations and to drive certain distances autonomously. With Sleepiz’ solution patients can get medically tested for sleep disorders in the comfort of their own home. The touchless device captures vital signs and sleep environment data in real-time with medical grade accuracy using an AI algorithm. The cloud-based solution saves time and money, therefore a higher number of patients can be screened for sleep disorders in a more efficient way. MotionTech 3D prints affordable, medical grade prosthetic silicone liners. The liner acts as a soft interface between the limb and the prosthetic leg and it is of the utmost importance that the fit is perfect. After a prosthetic technician 3D scans the limb, MotionTech produces the tailored liner within 72 hours. The prosthetic field is only one of many future applications. This startup offers custom AI processors for edge-computing applications such as wearables, medical implants, industrial sensors, autonomous cars or drones. Synthara's processors consume ten to a hundred times less energy in AI tasks involving audio, video or other sensors. They can create custom AI processor designs five times faster than the competition. Customers license Synthara's AI processors and integrate them into their chips. The major challenge in cancer therapy is developing targeted treatments that exclusively impact the cancer. T3 Pharma does exactly that by using living bacteria that have the capacity to specifically find and even grow in solid tumors where the bacteria serve as efficient factories for therapeutically active proteins. T3 Pharma’s bacteria are a powerful and versatile platform for targeted cancer therapy. 80 percent of the world’s antibiotics are used for livestock, leading to a global antibiotics resistance crisis. TwentyGreen’s natural probiotic feed additive improves animal growth and at the same time reduces the need for antibiotics. Critically, the probiotic is heat resistant so it can be integrated into animal feed. TwentyGreen is profitable for farmers and feed distributors alike while protecting our environment. The Varroa mite is a parasite that damages bee colonies in Europe and North America. Until now, beekeepers treated their bees chemically, which unfortunately also damages the bees. Vatorex uses the different heat tolerance of mites and bees. With a heating wire embedded directly into the brood combs, the bee brood is heated, which kills the mite. This treatment results in 31 percent improved development of the colony. In the coming weeks the jury will select its Top 10, based on expert reports, business plans, assessments and another presentation. Finally, these ten startups will present their business ideas at the award ceremony on May 27th before the winners are announced.